How do you keep your memory sharp? One way is to do all kind of tests, or to recall details of an event. We all forget things until something or someone reminds us of something, and the process of remembering starts. This happened to me in 1999. Until that year I had not thought about an event that had occurred shortly after my 18th birthday. But after I was reminded of something that had happened during that time, I slowly started to recall details in the coming months and years. The main people in this event were 2 girls from my hometown, a boyfriend of one of the other girls, also from my hometown, her future father-in-law, and a young foreign hitch-hiker. The boyfriend, who she later married, became a pilot in the German Federal Armed Forces and made career, but died during one of his flights with his fighter jet (Tornado) in January 1999 (see http://www.ejection-history.org.uk/Aircraft_by_Type/Tornado_Germany.htm). Now, let’s go back to the time of the event. It was in summer of 1971 when a girlfriend from my hometown with whom I also went to the same High School suggested a trip to Munich where her boyfriend went to university. Her boyfriend was enrolled in a university from the German Federal Armed Forces where he studied for an engineering degree. She also asked another girl from our hometown to accompany us on this trip. We both decided to join her, and her future father-in-law drove us to Munich. There he dropped us off, but before he left us to ourselves, he helped us to find a place were we could set up our tent. We actually set up our tent on a meadow of a farm in Fürstenfeldbruck. I only recall that her boyfriend’s father went to the farmer and asked him whether we could set up our tent on his meadow. The farmer allowed us to camp there. After her boyfriend’s father had helped us to set up the tent, we had only one tent with us, we were left to our own resources. I don’t recall which bathroom facilities we used, but I remember that we ate cold ravioli out of cans, which wasn’t fun. We stayed there for about a week. I recall, to get from place to another, we rented scooters. On one excursion by myself I picked up a young hitch-hiker. Since he didn’t speak any German, he spoke English, I thought I could find out with the help of the other two girls, how to help him. I didn’t understand him because I didn’t speak English at that time. The foreign languages I had to learn in school were Latin and French. When we arrived at the tent, only one of the girls was there, but she wasn’t any help because a guy was at her side and she didn’t speak English either. The other girl was in the barracks with her boyfriend, and she didn’t show up until the next day. I also remember that the weather was quite unpleasant, and that is was raining a lot during the evening and night. I had no idea what to do, so I let him stay in the tent. The next morning he left, and thereafter, I never saw him again. Over time this event faded from my memory, but years later I was reminded of this event by someone else, and slowly I could remember more details. Now, it surely helps when you have some kind of tangible reminder of an event. I didn’t know that anything existed from that trip until my youngest sister told me years ago, I believe it was in 2003, that I had written a postcard to my family when I had been in Munich-Fürstenfeldbruck in the summer of 1971. I didn’t remember that I had written a postcard, but here it was. A token of an unusual trip. 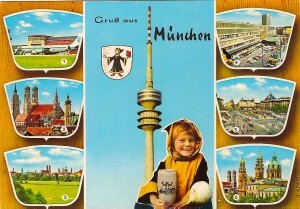 Now I am glad that my mother kept the postcard all these years. It certainly helped me to remember more details. This entry was posted on Tuesday, October 12th, 2010 at 11:21 pm	and is filed under General, Travel. You can follow any responses to this entry through the RSS 2.0 feed. Both comments and pings are currently closed.